﻿ Ruby MK1 or Ruby MK2 ? Ruby MK1 or Ruby MK2 ? The Ruby Saloon Type ARQ, now referred to as the Ruby MK1, was launched in July 1934. The Ruby ARR, now the Ruby MK2, was launched in July 1936, commencing with chassis no: 249701. When asked what the difference is many 'Seveners' will simply say that the MK2 has the 3 - bearing engine. In actual fact, this is not necessarily correct and there are also other, external and internal, differences which distinguish the two models. There are some small changes detailed in 'The Austin Seven Source Book' by Bryan Purves which are not immediately seen with a casual glance. A few late Ruby MK1s and the Ruby MK2 have the 3 - bearing engine which is identified by the bolt mounted centrally on the n/s (left as driven) of the engine above a vertical fin. 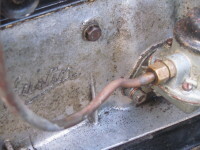 'The Austin Seven Companion' states at page 51 that 3 - bearing engines were introduced in June 1936 with engine No 249001 and were installed in last few of the MK1 Ruby. Bryan Purves confirms in 'The Austin Seven Source Book' at page 444 that the 3 - bearing engine appeared in the Ruby MK1 from 16 June 1936 starting with car no: ARQ 35724; chassis no: 247765 and engine no: 249052. The engine having an output of 16.5 bhp at 3400 rpm. The MK1 has a near right angle at the base of the windscreen pillar onto the bonnet. The MK2 has a curve at the base of the windscreen pillar onto the bonnet. The MK1 has a waistline moulding which runs from the front of the bonnet on one side around the rear of the car and along the other side. The MK2 waistline moulding is only along the sides finishing at the rear quarter where it widens and slopes downward. 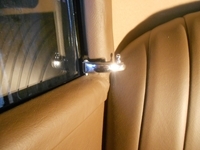 The MK1 rear windows are hinged at the front and opened at the rear with an over-centre clip. The MK2 rear windows wind-up and down. The MK1 front seats have a spring loaded locking bar, at the outer side of the seat frame, to pull out to allow forward and back adjustment with a pivot bolt at either side for tilting the seat. 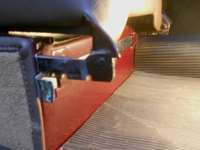 The MK2 front seats have a spring loaded locking bar on the inner side of the seat with hinges attached to the lower part of the sub-frame and fixed to the tool box below. This article, written by Doug Castle, originally appeared in CA7C Seven Focus in October 2016 pp22-24.